Artists' books are simply books made by artists. Whether tactile or conceptual, they range in thematic content including the political, the sentimental, or just about ideas of beauty. 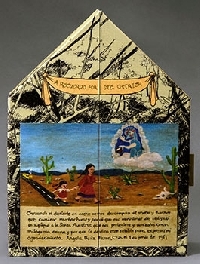 Artists' books defy conventional "reading" and involve the viewer though sight, touch, and physical manipulation. Too often locked behind exhibit cases, Hands On events make them available for you to touch, turn pages, and explore.